Subsea equipment has now been supplied for over 25 years, and with the current upturn in World Oil & Gas markets, more and more discoveries are being declared viable in deep and ultra-deep waters. New deepwater offshore discoveries in West Africa, Gulf of Mexico and the Pacific Rim (where exploration is now being undertaken beyond 4,000 metres water depth), are being developed where the wellhead is situated on the seabed. The confidence in the success of these subsea ventures is now being used in more onerous developments, Ormen Lange (NNS, block 6305) is one such development. 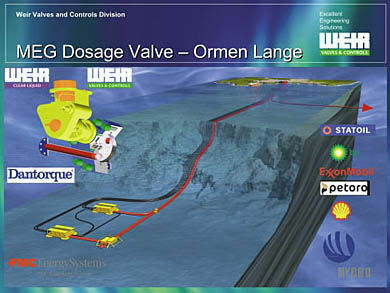 Situated off the northwestern coast of Norway, this field is currently being developed even though it sits in 1,100 metres of water on the edge of the Arctic Circle and can have an ambient sea temperature which is known to reach -2° C. The hydrocarbon gas contains entrained water that will inevitably bring hydrates formation into consideration. It will be piped to the onshore terminal which is 120 kilometres from the subsea templates. The depth of this field also makes it the deepest subsea project undertaken in Norwegian waters to date. Hydrates are ice-like lattice structures of hydrocarbons, which form when the entrained liquids are taken below the hydrate formation curve. When these occur, equipment is usually required to be brought to the surface for removal or “melting” of the hydrates. It has been known for the Hydrate formation to “thaw” when the equipment is being brought to the surface and to have disappeared completely by the time the valves have finally landed on the deck of the DSV (Dive Support Vessel). This downtime is very costly to the producer, and to this end, Weir Valves & Controls are now also working on methods of locally injecting Mono Ethylene Glycol (MEG) as a prevention against these hydrate formations. Also, by injecting pure methanol, we can dissolve the hydrates in situ should they form. The injection process will be performed by diverless remotely operated vehicle (ROV) intervention and will allow downtimes to be kept to an absolute minimum. This solution is critical for the future success of deepwater developments where hydrate formation in pipeline valves will become more and more prevalent. Weir Valves & Controls UK, in alliance with Weir Norge (Oslo) and Norsk Hydro, have now developed a MEG Dosage valve, to counteract the potential for hydrates to occur on the Ormen Lange project, by utilising MEG injection with dosage values which are above those usually associated with subsea developments. The dosage rates have been calculated to prevent the hydrates from forming within the process gas, which, has previously explained, contain entrained liquids. The MEG Dosage valve has been specifically developed to dose the process with MEG at varying rates of flow, which are dependant on well conditions. The costs associated with the MEG injection are significant and as such, when well conditions are not within those likely to bring the process towards the hydrate formation curve, the dosage is decreased and vice versa. The valve was originally developed to isolate flow, with the ultimate advantage of not having a cavity (zero displaced volume during stroke). This is significant, beause the valve will not drift on failure of the operator, and will not be detrimentally affected by a cavity, which could otherwise become pressure locked and/or blocked by hydrates or other formations. The turndown ratios (rangeability in excess 200:1), far exceed those of more traditional controlling devices, and whereas control and choke valves have inherent leakage, the MEG Dosage valve will give zero leakage on this application since the obturator is based on a conventional through-conduit gate valve design. The flow orifices on this unit are specific to this particular application, but can be altered to suit project requirements, this can be undertaken both theoretically and validated using flow assurance loops. The MEG Dosage valve on Ormen Lange is designed with application specific seals to best counteract the process conditions of this field. Amongst conventional sealing systems, it also features the Vector Duo seal, a metallic primary seal which offers metallic sealing against both process pressures out of the valve, and also environmental pressure into the pipeline, this feature is critical when working on deepwater applications. The pressure envelope is manufactured from forged 22 percent chrome duplex (ASTM A182-F51), the rotary gate and seats are manufactured from 25 percent chrome super duplex (ASTM A182-F55) with HVOF applied Tungsten Carbide coatings, and the controlling orifices are manufactured from sintered tungsten carbide inserts. The splined stems are manufactured from nickel alloys (Inconel 718), which offer both excellent strength and corrosion resistance. One other major advantage of this project is the use of field-proven and performance-tested subsea quarter-turn, double-acting Dantorque actuators. 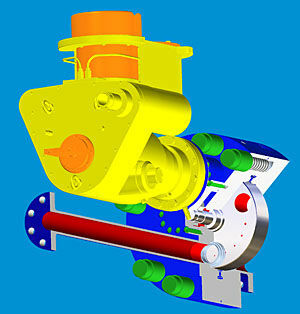 These units are more compact and better balanced than traditional scotch yoke-type actuators. 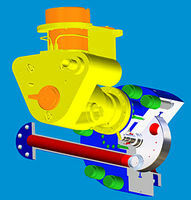 Initial testing on the drive system of the valve and actuator assembly also indicate virtual zero hysteresis. This system has also been specified and developed to be both totally stable and repeatable, thus guaranteeing the correct orifice and dosage is being delivered when required. One further advantage of the Dantorque solution being utilised is the inclusion of both hydraulic and electronic control modules which guarantee accurate positioning mid stroke. The unit also features remote electronic feedback which is fully programmable onshore via the electronic control module which uses CANbus communications. The testing regime undertaken on the prototypes will ultimately prove that this unit is suitable for the application, below is a summary on the tests being undertaken. Each orifice is being checked with regard to flow capacity at the required operating inlet pressures and differentials. The orifices have also been designed to assure the best pressure distribution within the orifice and the flow assurance is also being checked and recorded. Cavitation checks are also an important part of this work and initial results confirm that the valve will operate within the requirements of the system flow without the onset of incipient cavitation, with a suitable safety factor ie. if the process differentials are exceeded, we will still be operating within cavitating limits. The orifices are also being subjected to flow tests in regimes with and without sand particulate. Whilst sand is not expected, it is possible “fines” could be entrained within the MEG stream since the MEG will be reclaimed and re-circulated on this project. Due to the depths of the Ormen Lange field, the valve and actuator assembly will be extensively hyperbarically tested. This will consist of a static test at a pressure beyond the environmental depth, and also a dynamic test at the same depth rating. After all these tests are complete, the assembled unit will also be subjected to a 1,200 endurance test to prove the design life (30 years) of the assembly. The unit will ultimately be API 6A PR2 tested to finalise type testing requirements. It can be seen that the initial testing on this project is very positive and Weir Valves & Controls confirm this unit can be re-engineered in order to offer valves capable of isolation, control and choke applications. The design of the unit is also compact and should in time offer major cost savings in both space and weight. The addition of failsafe actuation will also be a major influence in the use of this valve on SSIV and HIPPS applications.